Dr. Hinch is a ‘fishy’ scientist studying how environmental conditions and human activities affect Pacific salmonids. His Pacific Salmon Ecology and Conservation Laboratory is committed to the study of salmonid ecology, behaviour and physiology, and to providing management systems with information needed for the conservation and sustainable use of fish resources. They use really cool and cutting edge technologies such as physiological telemetry and functional genomics to link an individual fish’s condition to its behaviour and fate determined by large scale tracking (radio interview with Dr. Hinch discussing salmon research). Recent studies explore the double jeopardy that salmon now face as freshwater environment’s warm and fisheries in freshwater increase in prevalence, and the effects of disease, climate warming, and abberant behaviour on conservation of some salmon runs. The impacts of forestry, hydro dams, and restoration activities are other anthropogenic factors currently under investigation. 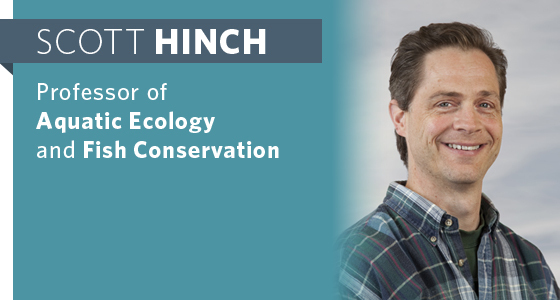 Dr. Hinch contributes to three undergraduate courses all dealing with aquatic systems and fish, and is the Director of the undergraduate program in Natural Resources Conservation.